Most dogs, even those that bite someone, aren't career criminals: they bite from fear or nervousness or overprotectiveness. They may bite just once in their lives. But once a dog has bitten or displayed dangerous tendencies, it makes sense to require its owner to take measures to prevent further injuries. Many cities, and an increasing number of states, are adopting "dangerous dog" or "vicious dog" laws. These laws seek to identify dangerous dogs and prevent injuries by making their owners take specific precautions, such as confining the dogs securely or muzzling them when in public. 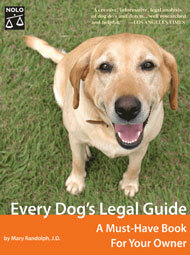 They may also require owners to buy liability insurance to cover any injuries the dog does cause. Owners who have deliberately created dangerous dogs by mistreating them may be subject to criminal fines and even jail sentences. Some laws automatically classify "pit bulls" as dangerous, and ban them from the city or impose strict regulations on their owners. Not surprisingly, these controversial laws have been tested in courts across the country - with mixed results.